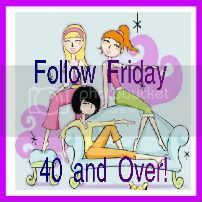 Welcome to the 63rd edition of Follow Friday 40 and Over!! This is fantastic, I joined your blog already. My name is Denise, my email address is shortybear.63@att.net. My link is http://shortybearsplace.blogspot.com/ Thank you. Hi, Ms. Java. I haven't visited much lately since my Mom's heart attack. Thanks so much for letting me join today. I put your button on my "Link-Ups" page. HOPE you have a great weekend! So happy to have found your blog. It's wonderful to have found so many mature , beautiful, funny,& inspiring bloggers! Hey Java! Joining with my new blog this time! Thanks for hosting another great hop Java, I hope you have had a great week! Happy Friday to everyone. So glad it's back! Missed having it last week. Thanks for hosting! Great blog, great fun, love all your buttons, I put them all over, LOL. What a great idea for a party, almost feels like getting free coffee at McDonald's :) Thanks for hostessing! Thanks for hostessing a great blog hop - I've followed your blog and would love a follow back! Thanks for hosting once again your linky. Have a fabulous weekend & if I don't talk to you have a very Happy Thanksgiving.